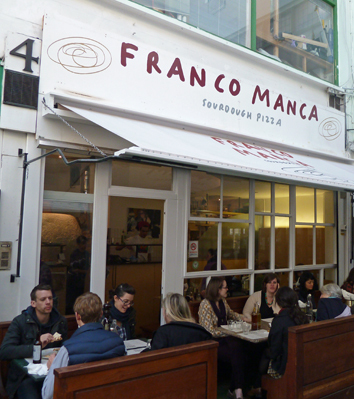 Franco Manca is in a spot where there has always (as far as I remember) been a pizza restaurant. 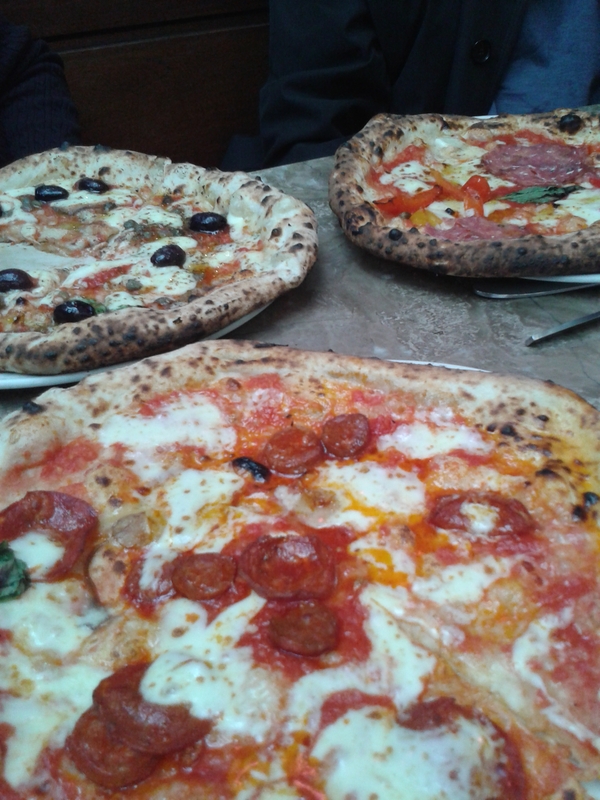 Previously run by an Italian family, their pizzas were delicious and there was always a good crowd at lunchtime. This is similar but definitely not the same. The restaurant has now expanded, so it is has an extension across from the cosy place with the ovens and it has opened out into the main market thoroughfare. This is not where the difference stops. This is not just a pizza restaurant – it is a sourdough pizza restaurant and that is not where the differences between these pizzas and ones served in most pizza restarants stop. The toppings are culturally eclectic too with Gloucester Old Spot ham and Spanish chorizo to choose from. There is an organis label to many of the ingredients and I also heard our waitress advising on the addition of other toppings to the number 1 to 6 list of pizzas. She was definitely against adding tomato to one of them and said it really spoiled the taste of the mushrooms (and she was probably right). So what about the taste – we had number 5 (with anchovy, stoned olives and capers) and 6 (with chorizo). As seating is close but not too personal we also viewed pizza 3 (with courgette and more cheese) and pizza 4 (with Gloucester Old Spot ham) on the next table and asked for reviews. Despite their size they were all demolished with the crusts being eaten with olive oil (plain or chilli) and sprinkled with freshly ground pepper and a little parmesan – all of which are available on each table. We drank beer and organic apple juice and lemonade. These are gourmet pizzas. The bases are tasty and elastic and they do not bury it in too much topping or too much cheese and no-one – thank heavens – comes around with a huge pepper mill. It would be hard to say that this is the real deal – it is just much better than that. Don’t believe their website this restaurant is open on Sunday lunchtime and while it was a secret you could always get a seat straight away. On most days this restaurant is no secret and there is often a queue. But Franco Manca prides itself on fast, efficient service. The food comes quickly and no-one hangs around for too long so you wait only a short time to get a seat. Prices are very fair and compare well with the other places in the market – around £6-£7 a pizza with extra toppings being 50p to £1.70 with drinks add £2.50 or so. There is wine – also organic (£3.00 a glass) and beer which is much the best to drink with these cheesey wonders.